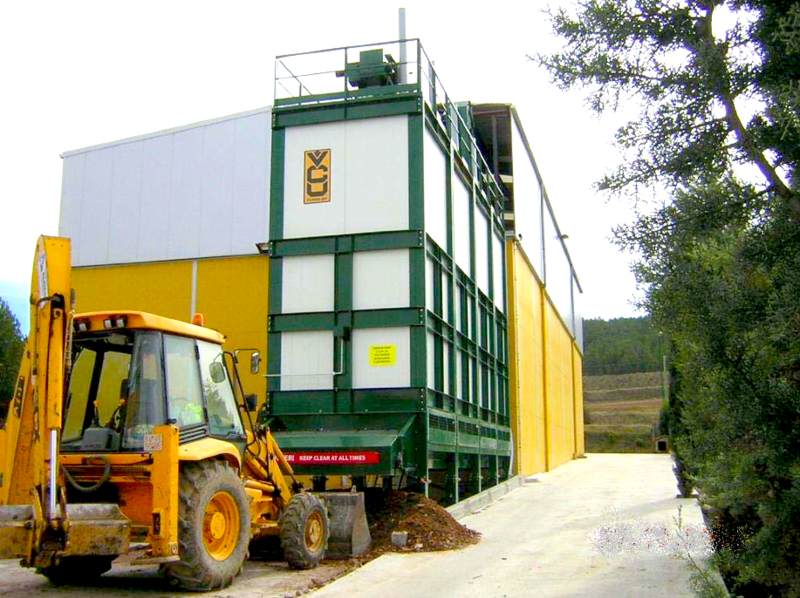 The VCU is an in-vessel, aerobic composting system suited to processing biological waste in small to medium sized municipal and industrial applications. 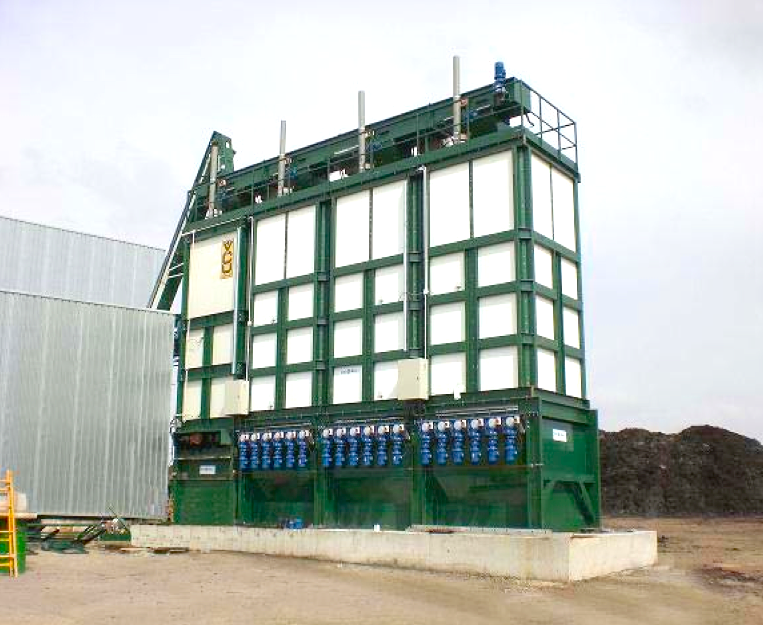 Composting takes place inside modular, insulated, stainless steel-lined composting chambers, measuring 4.5 metres high and 2.5 metres square. With a maximum throughput of 10 tonnes per day per chamber, subject to nature of feedstocks. Chambers are linked together to form systems of any capacity. The VCU system is typically favoured for facilities processing between 5,000T and 40,000T/annum. 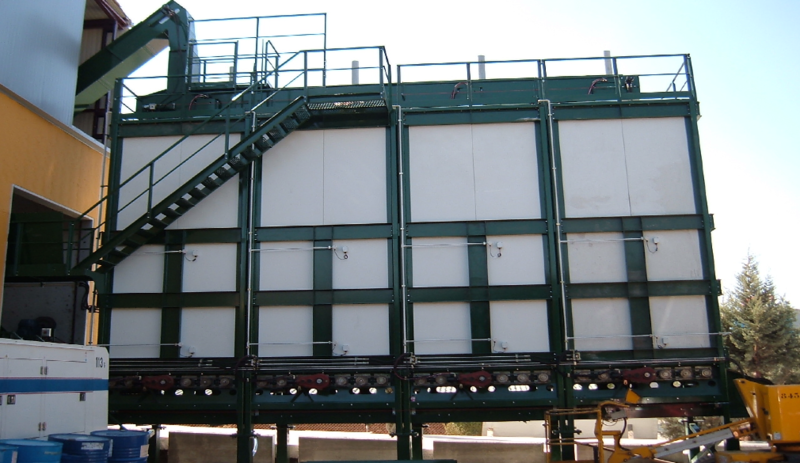 Biological waste must have sufficient structural material (or bulking agent) to allow the passage of air through the waste when it is in the chamber. 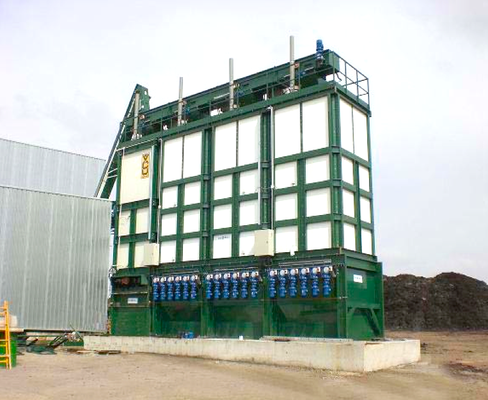 Bulking agent is typically shredded green waste or wood waste. 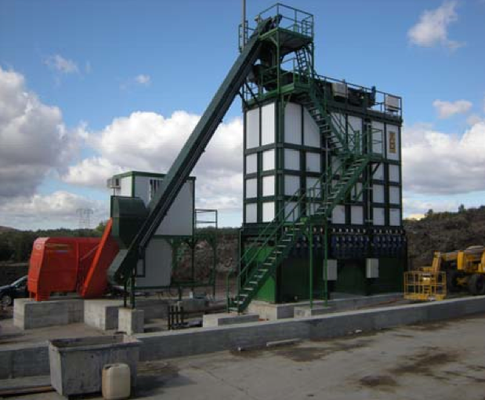 The proportion of bulking agent required depends on the kind of waste being processed and typically varies between 15% and 50% by mass. These wastes are mixed in a large batch mixer before being fed into the chamber by a series of sealed conveyors. The VCU’s working principle is a re-engineering of the traditional composting process, with air drawn up through the decomposing waste as it moves down through the chamber. Heat is generated by the metabolic activity of microbes at the chamber’s lower levels. Rather than let this metabolic heat energy dissipate to atmosphere, it is harnessed to help create a natural chimney effect that draws in cool air at the open base of the chamber.Due to the rising heat, temperatures vary between 40°C at the base of the chamber and in excess of 70°C at the top. 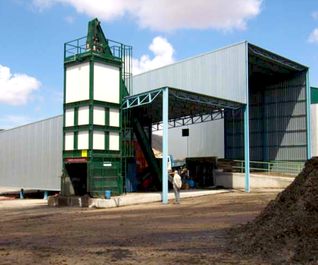 Effectively, daily waste input is heat treated before the degradation process begins. Based on natural principles, this system is very energy-efficient and does not require agitation, bio-filtration, external heating or air injection. With minimal moving components, maintenance and operating costs are very low. VCU Technology Ltd is the company behind VCU system.